Guess what! It's birthday time again. And, as usual, my husband's cake needed to be chocolate. But what else? I consulted the elderchild who suggested orange. 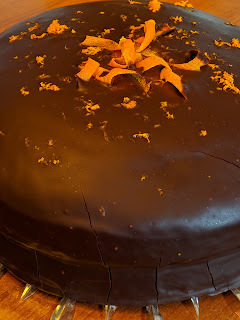 After tossing a few ideas around (chocolate-orange mousse filling?) 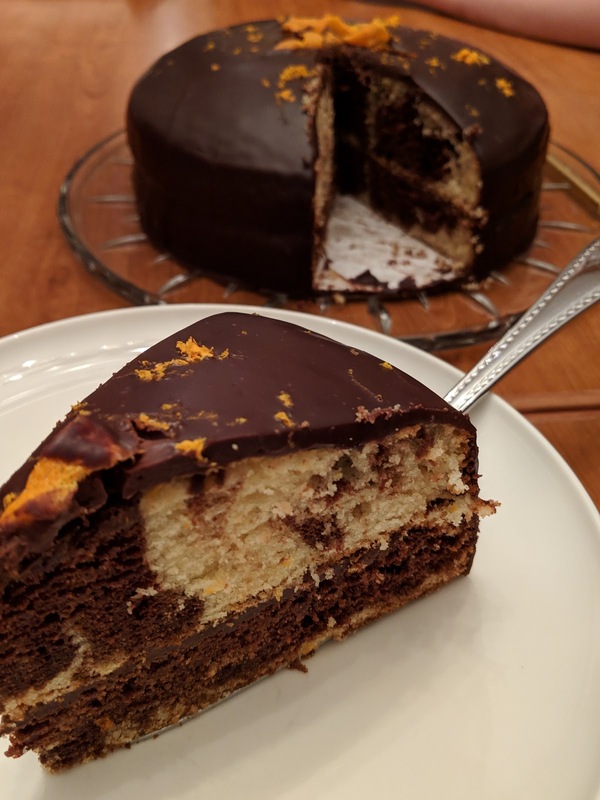 I settled on a marbled cake. I warned my husband I was making it up and got to work. First I made two batters: Orange cake, from this recipe, but I scaled it down to 2/3 of the recipe. And I made half of my usual sour cream chocolate cake recipe. 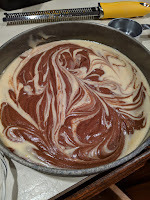 Then I spooned everything into two cake pans and swirled them with a knife. Since I wasn't sure how long they'd need to bake I checked on them frequently. Ultimately they baked for 35 minutes. 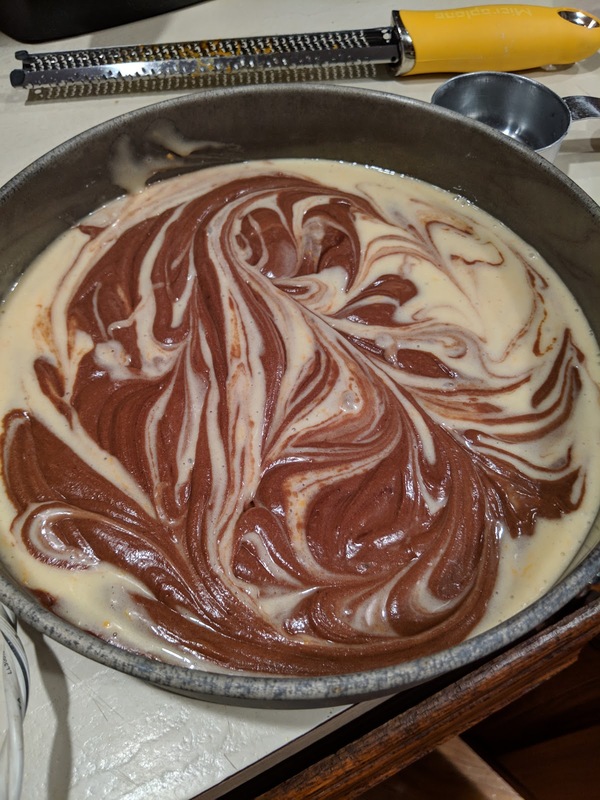 After they cooled, I made ganache: 10 oz of cream, 10 oz of 60% chocolate (bittersweet), 2 T. butter. Once everything was cooled and the ganache was the correct consistency, I assembled the cake. Since the layers were very rounded on the top I cut off the excess on one layer and that became the bottom. 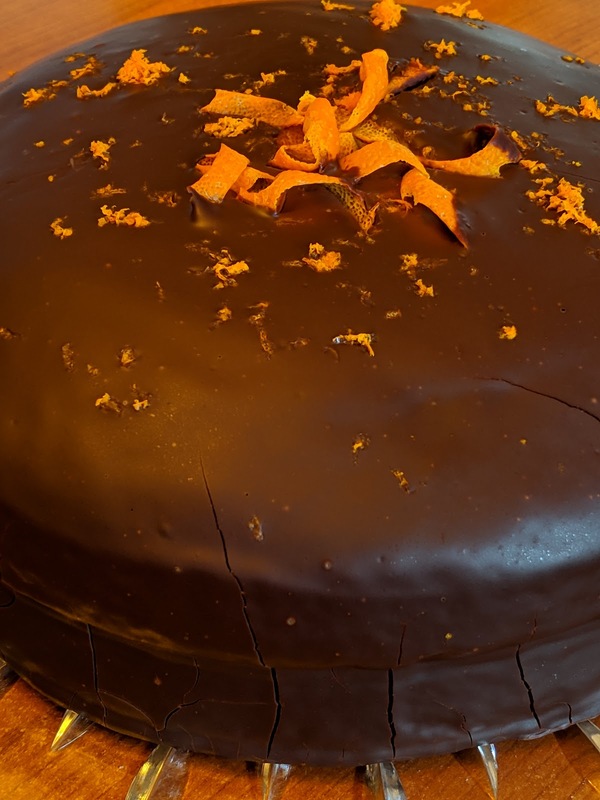 I used ganache and orange zest between the layers and then put the intact, rounded layer on the top. Then I poured the rest of the ganache and allowed it to enrobe the cake. I topped it with more orange zest and then some orange curls - I used a peeler to get strips of zest and curled them on a chopstick before placing them on top. One thing I should not have done - refrigerate the cake. Unfortunately, the ganache cracked slightly. But not too bad. This experiment was a success! After a birthday outing to an escape room, we had take-out Chinese dumplings and then, cake!